For years now the debate about red meat has raged on and whether it is in fact any good for you or not. Here are the most common questions people have about a food that has been in our diets since we were all hunter-gatherers. Studies have shown that some red meats are higher in saturated fats than other protein-rich foods such as chicken and fish. Saturated fats, if eaten in large qualities, can result in high cholesterol levels, which can increase the risk of heart disease. A recent study has shown that people who eat two portions of red meat a day are more than 30 per cent more likely to die from heart disease than those who didn’t eat it in such high quantities. However, it has also been proved that eating one or two portions of red meat each week has no adverse effects on health. Many researchers would answer “yes” to this question, especially when it comes to colon and breast cancer. A recent study carried out by the National Institutes of Health-AARP in America concluded that adults who ate the most red and processed meat over 10 years were likely to die sooner then those who ate smaller amounts. 100 grams a day or more was considered very harmful and anyone who ate this amount was far more likely to die of cancer than those who consumed around 15 grams a day. The main reasons for red meat causing cancer have been flagged up as the high saturated fat content, which we know also causes heart disease, and carcinogens, which form when meat is cooked – especially on a BBQ. Heme iron, which has been found to damage human cells and promote cancer, is also present in red meat, adding fuel to the debate. 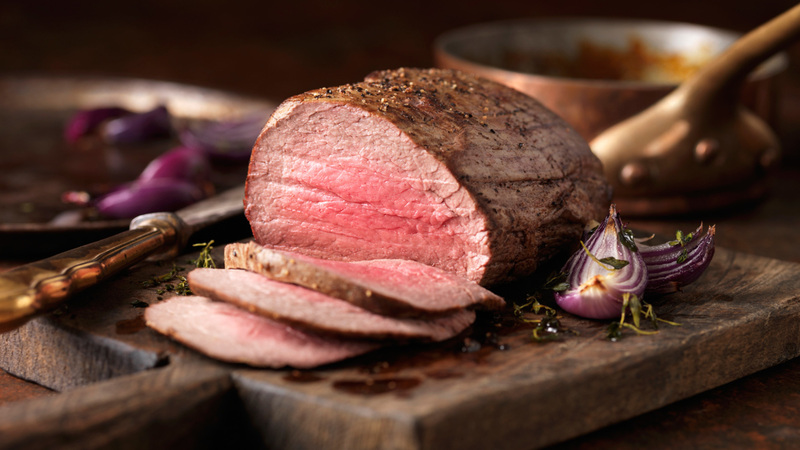 Does red meat have any nutritional benefits? Yes! Red meat certainly does have nutritional benefits and scientists are currently trying to find out whether they outweigh the negative effects that red meat is said to have on our bodies. In fact, red meat is one of the best sources of five essential nutrients that we need to function properly. It is packed with iron, which many females of child-bearing age are lacking as they lose it in their monthly menstruation cycles, and red meat also contains high levels of zinc. After fish, red meat has the highest levels of Omega-3 and is also a great source of B vitamins and protein. Scientists and health experts have debated over this for years and each country seems to have different guidelines on acceptable daily amounts. It depends on the activity levels of a person, how much they weigh and what else is present in their diet. As a general rule in the U.K., we are advised to consume no more than 70 grams of such meat a day in order to cut the risk of developing bowel cancer and breast cancer. This is the equivalent of three slices of ham, one lamb chop or two slices of roast beef a day. Other guidelines state that if you plan to have a meal that includes red meat, such as a hamburger or steak, make sure the meat makes up a quarter of the meal while vegetables and carbs comprise the rest. With so many growing concerns about what to put into our bodies it is easy to get swept up in it all. As long as everything is eaten in moderation, with special care taken to avoid cigarettes, alcohol and large amounts of red meat, you should be putting yourself in good stead to have a long and happy life!